Inviting you to join the revolution of gathering women. and the miracles that unfurled. After the Vote, what did Alice do? 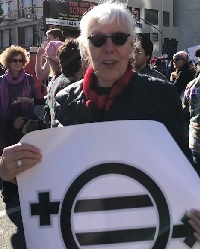 to give women full Constitutional Equality. Let us start a revolution. Let us lift women out of invisibility. My commitment to you is I will not let you fade into invisibility. Take my hand. Lets tell the truth. I SEE YOU. I TRUST YOU. Agitate, Ignite, "Create an Acute Situation." Engage Zoe for your club, organization, school, or community. For more information click their pages above. See Book & Contact page for details. I am just a little disturbance, are you? Zoe Nicholson is a satyagrahi, just as Pankhurst, Gandhi, Rosa Parks, and Caesar Chavez were. Her clear and forthright exploration of her intentions and motivations invites us into the mind of those who create and follow the path of non-violent resistance to injustice. I am an activist, are you? permission to stand, to draw a line, to refuse to move. What is your line? I am here to encourage you to step up. step slower or faster. What is your next step? Zoe Nicholson is a tour de force. Nicholson never ceases to inspire. Her memorable speaking engagements leave my students with deepened insight, renewed vigor and courage. She is a living legacy and a wealth of knowledge and experience. We are all privileged to learn from her. The Truth of you is your ultimate act of resistance. Zoe's life is a profile in courage and perseverance. Anyone who hears her message will find their own audacity to fight for equality. To integrate society, we have to be a fully integrated human being. (Zoe’s) message is highly impactful and empowering for people regardless of their exposure to social justice issues. Zoe is a smart, fun, engaging, and inspiring speaker whom I recommend enthusiastically. & then one comes along that holds a lifetime. I am fasting for equality of rights under the law in the U.S. I am fasting to legislate treating adults without regard to gender. I am fasting to criminalize discrimination. But my heart wants so much more. From the Hungry Heart, June 16,1982, Day 30 of the fast. I am in love with equality and you are too. Because, in fact, there is no place else to be. Zoe Nicholson has had a profound impact on my students. Each year, she provides real life testimony to the readings and feminist theories that my students study. Zoe has an incredibly rich activist history. She is a champion of the Equal Rights Amendment, GLBTQ rights and human rights in general. Zoe is a humanist who cares about injustices to all persons. She isn't just a one issue activist. Zoe Nicholson is an activist, writer, and all around awesome human being who spoke to us about activism and how all of us have the power to create change and be an activist. Zoe infused in us the idea of talking about the issues and problems that are in front of us. She said that just by speaking up or one’s own actions we are an integral part of the movement and are activists. We are the well, the brave, capable. and live openly in the light of day. advancing the river of human consciousness. Zoe Nicholson © 2019 All Rights Reserved.